Marmoset is the common name for the small, arboreal New World monkeys comprising the genus Callithrix of the primate family Cebidae, characterized by claw-like nails instead of the flat nails of other primates, long lower incisors, a specialized cecum, and squirrel-like movement in trees. All marmosets feed on plant exudates (such as gum, sap, and resin) as well as an insectivore diet (Cawthon Lang 2005a). The term marmoset is also used in reference to the Goeldi's marmoset (Callimico goeldii), a New World monkey that is not part of the genus Callithrix and is not discussed in this article. Found in South America, from Colombia and Ecuador to the north and Brazil and Paraguay to the south, marmosets are important components of food chains (and likely seed dispersal as well). As quite small primates, they are preyed upon by diverse mammals and birds, including felids (such as ocelots), mustelids, arboreal snakes, raptors, and owls (Cawthon Lang 2005a, 2005b). For humans, marmosets are well-known New World monkeys, adding to the wonder of nature with their unique forms and behaviors, and thus an important focus of ecotourism. This monkey also is mentioned in Shakespeare's Tempest, when Caliban says he will instruct his new master Stephano "how to snare the nimble marmoset" [for eating], on the no-man island where the play takes place (Act 2, Scene 2). As New World monkeys, marmosets belong to the Platyrrhini ("flat-nosed") parvorder, whose members typically are characterized by relatively broad noses with side-facing, widely separated nostrils, as opposed to the close-set, downward or forward facing nostrils of the Old World monkeys and apes placed in the parvorder Catarrhini. Within Platyrrhini, the marmosets (genus Callithrix) belong to the family Cebidae and the subfamily Callitrichinae (Cawthon Lang 2005a). The Cebidae family also includes squirrel monkeys, tamarins, and capuchin monkeys. Members of the Callithrix genus have a number of unique morphological, reproductive, and behavioral features. With the exception of the big toe (hallux), they have claw-like nails (tegulae) rather than the flat nails (ungulae) characteristic of other primates, including humans (Cawthon Lang 2005a). Callitrichines have elongated, narrow, chisel-shaped lower incisors, which is an adaptation aiding their ability to gnaw trees and obtain exudates, such as sap, and they have an enlarged cecum (part of the large intestine), with specialized gut bacteria, that allows extended time for digestion of plant gums (Cawthon Lang 2005a, 2005b). Marmosets also have tactile hairs on their wrists, lack wisdom teeth, and their brain layout seems to be relatively primitive. Behaviorally, marmosets tend to have a squirrel-like movement, clinging vertically on trees, running across branches quadrupedally, and moving between trees by leaping (Cawthon Lang 2005a, 2005b). Reproductively, an unusual trait for primates is that marmosets tend to give birth to non-identical twins, more than singletons or identical twins (Cawthon Lang 2005a, 2005b). Metabolically, a marmoset's body temperature is unusually variable, changing by up to 4 degrees Celsius (7 degrees Fahrenheit) in a day. Most marmosets are about 20 centimeters long. However, the pygmy marmoset (Callithrix pygmaea) measure on the average only 13.6 centimeters (5.35 inches) and weigh only 119 grams (4.2 ounces), making them the smallest monkeys in the world (Cawthon Lang 2005b). In the common marmoset (Callithrix jacchus), also known as the true marmoset or white-tufted-ear marmoset, males measure on the average 18.8 centimeters (7.4 inches) and females 18.5 centimeters (7.28 inches), with the average weights about 256 grams (9.03 ounces) in males and 236 grams (8.32 ounces) in females (Cawthon Lang 2005a). 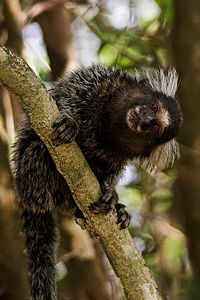 Marmosets are found in Brazil, Bolivia, Paraguay, Peru, Ecuador, and Colombia (PIN 2008). Marmosets are highly active, living in the upper canopy of forest trees, and feeding on plant exudates, insects, fruit, and leaves. Marmosets are exudativore-insectivores (Cawthon Lang 2005a, 2005b). That is, all callitrichines feed on plant exudates, such as gum, sap, latex, and resin, and also consume insects and other small animals. The exudates are the main part of their diet. Their sharp lower teeth help them to gouge holes in trees or vines to consume the gum, sap or other fluids that are exuded. Some species are specialized feeders on gum. Marmosets supplement their diet with fruits, seeds, flowers, fungi, small invertebrates (such as snails), and small vertebrates (such as lizards, tree frogs, bird eggs, and small mammals) (Cawthon Lang 2005a, 2005b). Common marmosets (C. jacchus) spend most time on exudates and about 24 to 30 percent of their feeding time foraging for insects, while pygmy marmosets (C. pygmaea) spend about 60 to 80 percent of their feeding time on exudates and 12 to 16 percent of their time on insects (Cawthon Lang 2005a, 2005b). Marmosets are social animals, living in family groups of 3 to 15, consisting of one to two breeding females, an unrelated male, their offspring and occasionally extended family members and unrelated individuals. Their mating systems are highly variable and can include monogamy, polygyny, and occasionally polyandry. While in most species fraternal twins usually are born, triplets are not unknown. Like other callitrichines, marmosets are characterized by a high degree of cooperative care of the young and some food sharing and tolerated theft. Adult males, females other than the mother, and older offspring participate in carrying infants. Most groups scent mark and defend the edges of their ranges, but it is unclear if they are truly territorial, as group home ranges greatly overlap. Because exudates are abundant, inter- and intraspecies competition may not be important and marmosets can live at extremely high population densities; the common marmoset can have densities as high as eight animals per hectare (Cawthon Lang 2005a). According to recent research, marmosets exhibit germline chimerism, which is not known to occur in nature in any other primate (Ross et al. 2007). Germline chimerism is when the sperm and egg cells of an organism are not genetically identical to its own. Marmosets can carry the reproductive cells of their twin siblings, because of placental fusion during development. Twenty-one species of marmoset currently are recognized (PIn 2008). There has been considerable taxonomic revision in primates over the years, which is also reflected in the marmosets. For example, the Integrated Taxonomic Information System (ITIS 1999a, 1999b) listed Callithrix in 1999 as a member of the Callitrichidae family, a taxon that also included tamarins and Goeldi's monkey, whereas recent taxonomies recognize Callithrix as part of the subfamily Callitrichinae of the family Cebidae (PIN 2008). ↑ C. Groves, "Order Primates," "Order Monotremata," (and select other orders). Page(s) 129-133 in D. E. Wilson and D. M. Reeder, eds., Mammal Species of the World, 3rd edition, Johns Hopkins University Press (2005). ISBN 0801882214. Cawthon Lang, K.A. 2005a. Primate Factsheets: Common marmoset (Callithrix jacchus). Taxonomy, morphology, and ecology. Wisconsin Primate Research Center. Retrieved June 29, 2008. Cawthon Lang, K.A. 2005b. Primate Factsheets: Pygmy marmoset (Callithrix pygmaea). Taxonomy, morphology, and ecology. Wisconsin Primate Research Center. Retrieved June 29, 2008. Integrated Taxonomic Information System (ITIS). 1999a. Callitrichidae Gray, 1821 ITIS Taxonomic Serial No. : 572774. Retrieved June 29, 2008. Integrated Taxonomic Information System (ITIS). 1999b. Callithrix Erxleben, 1777 ITIS Taxonomic Serial No. : 572807. Retrieved June 29, 2008. Primate Info Net (PIN). 2008. Marmoset (Callithrix sp.). Wisconsin Primate Research Center. Retrieved June 29, 2008. Ross, C. N., J. A. French, and G. Ortí. 2007. Germ-line chimerism and paternal care in marmosets (Callithrix kuhlii). Proc. Natl. Acad. Sci. USA 104: 6278. PMID 17389380. Retrieved June 29, 2008. This page was last modified on 23 July 2008, at 14:15.